TIME TO REGISTER FOR OUR SPRING SESSION! Click here for our paintings and to register! 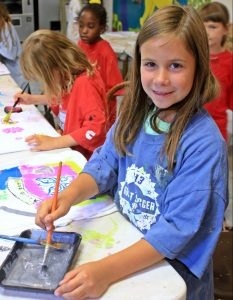 Kids love to create with their friends so what about an ART PARTY at the Wyoming Fine Arts Center!? Bring your friends, cake and drinks to the Center. We will bring out creative and artistic side of your guests and throw a memorable party where we provide the party favors! Art parties include an experienced art teacher, the room, art supplies and step-by-step instruction. We will also clean up the mess after the party! Let us know what theme you would like, and we can work with you to plan an exciting art making activity! Parties are $150 plus the cost of materials per child (This charge is approximately $10 and up per party guest depending on the project chosen). 5 year olds and up. Fridays, Saturdays or Sundays. Times when the art room is available will vary. To secure the best time, please call us or contact us here.